This three ingredient dip is gonna cRock your world! This recipe is fast, so you have to watch it. I repeat, you have to watch this recipe closely. If you do not watch this recipe closely, I am guessing you will have a nasty mess on your hands. So, I beg of you, check on this often. The total cook time was only about a half hour for me (it may not be the same for your crock pot), so it isn't hard at all. As soon as you see the cream cheese and caramel start melting, get to stirrin'! So as I was telling Cris about how scrumdiddlyumptious this dip was and how it was SO worth the little bit of effort it takes to make sure the caramels get melted down, she tells me that the grocery store she goes to has something called Caramel Bits for recipes just like this! That's the difference between living close to a city or in the middle of corn fields folks! So if you have caramel bits available to you, go for it! 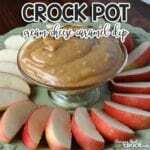 Cris has used them in her yummy Crock Pot Caramel Dip and they worked wonderfully. In the picture, you might see some "lumps" in my dip. This is just where I didn't stir it until smooth. Honestly, I really like the lumps in it, but if you don't think you will, go ahead and stir until it is super smooth. I used Dotty (my 2.5 Quart Circle Crock Pot with pretty purple dots) for this recipe. You don't need a very big crock pot for this one. If you are going to be serving a ton of people, then you will want to double or triple this recipe (which will change the size of crock pot you need). I promise you it will disappear faster than you say super-amazing-deliciousness-on-an-apple!